The Nikon D5300 is ideal for anyone new to photography who wants the option to swap the lens (or lenses) in use and get creative. In a break from convention, the camera comes in glossy red or a gun-metal grey, alongside the standard black. Also unusual is the single shell construction – known as ‘monocoque’ – manufactured from carbon-fibre reinforced plastic. 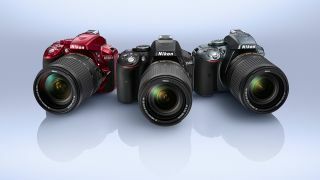 On launch, this was also Nikon’s first consumer-level DSLR to offer Wi-Fi, with a dedicated ‘i’ button provided for its implementation. Add to this a decent 24.2MP resolution from an APS-C format sensor, plus a tilting LCD screen that's a slightly larger-than-average 3.2inches in size, and it appears as a solid entry-level choice. In terms of suitability for low-light photography, the D5300 offers a core ISO range that can be boosted from ISO 12,800 to a setting equivalent to ISO 25,600, while Full HD video recorded with stereo sound recording should be more than capable for everyday use. Due to the on/off switch ergonomically encircling the shutter release button, we were able to start shooting with this DSLR quickly. Though layout is a little busy, the shooting mode dial is the size of a ten pence piece and itself handily surrounded by a lever for activating Live View mode. As we’d expect, shooting options accessible at the flick of a thumb here include Program, Shutter priority, Aperture priority or full Manual control, although you can set it to Auto if you want the camera to make all the decisions. Battery life is rated to a respectable 600 shots from a full charge of the battery, and as far a picture quality goes, you couldn’t hope for better from an entry-level DSLR. Though default colour settings can appear a little neutral on occasion, these can be boosted with a Vivid setting. The fact that the LCD monitor can be swung outwards from the body as well as turned to face the subject is a further boon – particularly if selfies are your thing. Though in many respects this DSLR is more of the same for its manufacturer, the high pixel count, flexible LCD, eye-level optical viewfinder and Wi-Fi means it has much to recommend it. If you like the sound of the D5300 you may also want to check out the more recent D5500.